The United States-South Korea co-production is directed by Bong Joon-ho, who has ventured into monster movie territory with 2006’s The Host. Bong’s other credits include the acclaimed drama Mother and the post-apocalyptic sci-fi fable Snowpiercer. Okja revolves around a young girl named Mija Ahn (Ahn Seo-hyun), who will stop at nothing to prevent a greedy multi-national corporation from capturing and imprisoning her best friend, who just happens to be an enormous creature named Okja. We can expect shades of Mighty Joe Young and other “a girl and her X” stories, but with a Bong Joon-ho spin. Bong co-wrote the screenplay with Jon Ronson, an investigative journalist whose book was the basis for The Men Who Stare At Goats. 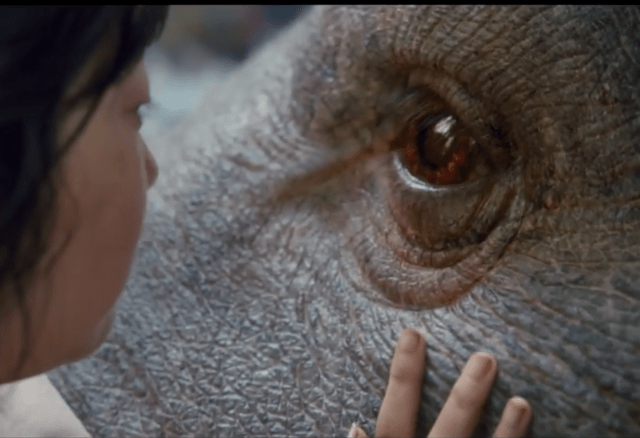 “With Okja I want to show the beauty that can exist between man and animal, and also the horror between them,” Bong said in a Netflix press release. In addition to Ahn, the film’s cast includes Tilda Swinton, Jake Gyllenhaal, Paul Dano, Steve Yeun, Lily Collins, Byun Hee-bong, Shirley Henderson, Devon Bostick and Giancarlo Esposito. Prolific cinematographer Darius Khondji, whose credits include Se7en, Evita, Amour and Midnight in Paris, is the film’s Director of Photography. Brad Pitt is a co-producer, through his Plan B production house. Okja was shot in Seoul, New York and Vancouver, and will be in English and Korean. Okja premieres exclusively on Netflix June 28.